Ever since 1943’s Frankenstein Meets the Wolf Man, there has been a steady flow of movies that toss together famous characters from different films just to see what would happen if they met. More often than not, these characters end up fighting one another – usually by mistake, but not always. Perhaps unsurprisingly, Zatoichi Meets the One Armed Swordsman, the twenty-second installment in the long-running Zatoichi series, does not deviate from this formula. But while the two famous characters do meet, and do eventually draw swords on one another, what’s covered in the distance between those two points is pretty compelling in its own right, a feat that separates Zatoichi Meets the One Armed Swordsman from the rest of the pack. Shintaro Katsu and Jimmy Wang Yu shine in this engaging tale of swordplay, mistaken identity, and cross-cultural (mis)understanding. My full review for the film can be read here. Released in 1967, The One Armed Swordsman made an incredible impact on Hong Kong cinema, establishing a whole new style for wuxia movies and catapulting young Shaw Brothers actor Jimmy Wang Yu into martial arts superstardom. With the film raking in the cash at the local box office, it was perhaps a foregone conclusion that Wang Yu’s iconic hero would return. And just two years later, Return of the One Armed Swordsman made its way to theaters. Chang Cheh, the director at the helm of this rollicking follow-up, clearly subscribed to the “more is more” philosophy of sequel-making. This film boasts more villains, more weapons, more fighting, and more over-the-top action than its predecessor. 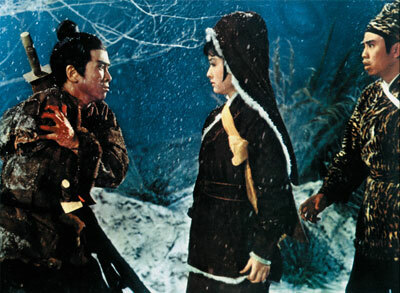 The storyline isn’t quite as compelling nor as personal as the one depicted in the original, but thanks to a solid performance from Jimmy Wang Yu and a surprisingly explicit critique of Jiang Hu, Return of the One-Armed Swordsman avoids the trap of simply being just another empty, overblown action extravaganza, and results in an impressive work in its own right. If you’re interested in learning more about this highly entertaining film, my full review can be found here. Hong Kong cinema is replete with iconic figures. Whether it’s the high-flying swordsmen in numerous wuxia films, the stylish urban killers that populate the bullet-riddled filmographies of John Woo and his heirs, or the various cinematic incarnations of Chinese folk heroes like Wong Fei-Hung and Fong Sai-Yuk, it’s become abundantly clear that Hong Kong filmmakers know a thing or two about creating unforgettable on-screen heroes.